Valeo (Euronext ticker: ENXTPA, market capitalization of over €14 billion), headquartered in Paris, France, is one of the world’s leading automotive suppliers, with revenues in excess of €16.5 billion. Valeo offers innovative products and systems aimed at CO2 emissions reduction and improved vehicle performance, as well as the development of intuitive driving. 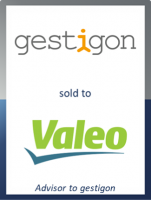 Now that software competence is increasingly becoming a key differentiator in the automotive world, gestigon's unique software, based on Artificial Intelligence, will significantly strengthen Valeo’s position in the field of intuitive driving. Sascha Pfeiffer, Managing Director at GCA Altium, said: "It has been a pleasure to advise gestigon’s shareholders on this landmark transaction in the virtual reality technology space. The team, under Sascha Klement’s and Moritz von Grotthuss’s leadership, has developed a unique software which detects human presence, gestures, motions, poses and biometrics in 3D data. We ran a highly competitive global M&A process to find the perfect solution for the shareholders and right strategic partner for gestigon." This marks GCA Altium's 35th transaction in the Technology sector within the last two years, underscoring our leading position in Europe in this area.